Imagine that you have just purchased the latest self-driving car and you are on your way to work. The car is in control because the route is familiar and the car has all the modern sensing and decision-making functions. You assure yourself that you can take control of it at any time. But if there is a sudden dangerous situation—someone darts into the road or another vehicle is moving erratically—will you do so? I venture that the answer is yes if you are an experienced driver of old-fashioned cars that need to be driven—your instinct will be to rely on your own skills to avert problems. If you learned to drive after the self-driving technology was the standard? I’m guessing the answer might be no. And the answer could be very consequential. Research by Matthew Beane published in Administrative Science Quarterly explores a situation with similarities to this one. He examined what’s happening in operating rooms around the world, where robots are increasingly used to perform surgeries. At least for the moment, the most effective robots do not make their own decisions, but they can be controlled quite effectively by a single surgeon at the control panel. That single surgeon often no longer needs a team performing different surgical tasks for the operation to go smoothly. And that surgeon is not likely to give up the controls during a challenging operation to a medical intern who needs to learn how to perform the surgery. If you’re the intern, that leaves you in a position of scrambling for any opportunity you can get to practice with the new technology so you can gain the necessary skills to guide the robots. At the same time, you aren’t (as often, at least) part of a surgical team performing traditional surgeries, so you aren’t building the skills that are essential backups if something goes awry during the robotic surgeries you’re observing. Surgeons don’t live forever. What happens when they are replaced by the interns who are currently receiving less hands-on training than they had? I guess we’re all going to find out. We immediately understand that less training of surgical interns is a very bad idea, but that does not solve the dilemma. Surgeries using robots are performed best by the most experienced surgeons with minimal help, so actively involving residents adds time and risk. The residents can do little more than observe the surgeon controlling the robot. The onus was on the residents Beane studied to learn the skills with minimal costs to the attending physician in charge. And some of them did, showing significant ingenuity in the process. Because the robots were only supposed to be used by the most qualified surgeons, only two approaches to learn were open to the residents. They could learn when the surgeon was not there, or they could learn as a favor from the surgeon. Learning when the surgeon was away could be done before they even became residents at the hospital, if they were lucky enough to be in a place with the right equipment and surgeons who allowed them to practice. It could also be done by watching recordings of earlier surgeries, though this type of training only showed what the robot did, not how to use the actual controls. The other option is to learn from the surgeon during an actual operation. Usually that means getting control of the robot during the less critical part of the operation, and being watched over by the surgeon at every step. This approach is fast and accurate, but it also means that any mistake becomes very visible, and usually leads to the surgeon taking over the controls right away. It is the best way of learning, but also the scariest one. The risk was real because residents would be compared based on very few operations, and surgeons would prefer to continue working more with those who had done best – whether it was because of skill or because of luck. The difficulty of learning when robotic equipment takes over a production process but still needs human control is not just in hospitals. The self-driving car is an example, and there are many examples of more subtle processes. The software that recommends whether an applicant can get a mortgage or not, and at what interest rate, is an invisible robot that can be controlled by the bank employee. But as the software gets smarter and the employees get less training, they have less foundation for checking its work, or even to be employed at all. Robots are smart, but organizations need to use them smartly. that less training of surgical interns is a very bad idea, but that does not solve the dilemma. 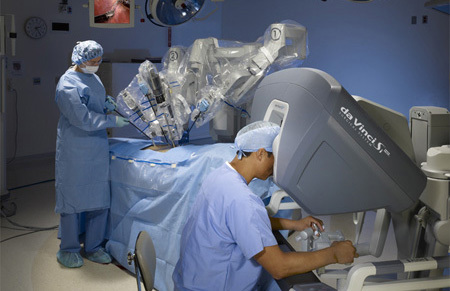 Surgeries using robots are performed best by the most experienced surgeons with minimal help, so actively involving residents adds time and risk. The residents can do little more than observe the surgeon controlling the robot. The onus was on the residents Beane studied to learn the skills with minimal costs to the attending physician in charge. And some of them did, showing significant ingenuity in the process. Beane, Matthew. 2019. Shadow Learning: Building Robotic Surgical Skill When Approved Means Fail. Administrative Science Quarterly, 64: 87–123. There is also a TED talk on this research.